Are you in the market for a new SUV? If you are, you’ve likely wondered about the 2016 Toyota Highlander price and how it compares to that of other popular SUV models. Does the Highlander offer the features you’re looking for at the price you want? Or will you get more for the money in a competing vehicle like the 2016 Honda Pilot? Come along for the ride as we explore the pricing and some of the amenity offerings of these two rival SUVs. Which one will prove superior? Let’s find out! Pricing is close between the Pilot and the Highlander, which are separated by only a few hundred dollars at their comparable trim levels. The Pilot models offer various features that the Highlander doesn’t. At the base-model level, the Pilot provides amenities like front active head restraints, which are not offered in the base-model Highlander. The Pilot also features an available rear electronic parking aid with camera, which the base-model Highlander doesn’t offer. The Pilot further offers available fog lights, which the Highlander base model doesn’t provide, as well as armrest storage, which isn’t available in the Highlander base trim. Floor mats also come standard but are only available as an optional, extra-cost upgrade in the base-model Highlander. In the Pilot Touring and Elite models, standard parking sensors are offered to help alert drivers when vehicles, pedestrians, and obstacles are behind or in front of their vehicle. The Highlander models, in contrast, do not provide a front parking aid. A remote vehicle starting system is offered standard in the Pilot EX, EX-L, Touring, and Elite trims, while the Highlander doesn’t offer a remote start system. The Pilot Elite further offers standard automatic, rain-sensing windshield wipers, while the Highlander models only feature manual variable intermittent wipers that have to be adjusted by the driver. 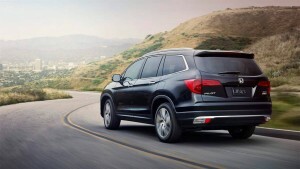 Drivers can further explore the 2016 Honda Pilot and the various areas in which it defeats the competition at any Central Illinois Honda Dealers location. Visit one of our associated dealerships or contact us today to take the Pilot for a test drive. 0 comment(s) so far on How Does the 2016 Toyota Highlander Price Measure Up to a Honda?